STOP PRESS!!! A new book is due for release by Allan Berry of Thames. A previous book on the Kauaeranga Valley provided a full history of the valley and the early settlers. Berry's new book is focused on Thames, and is due to be released in time for the start of the town's 150th Commemorations. 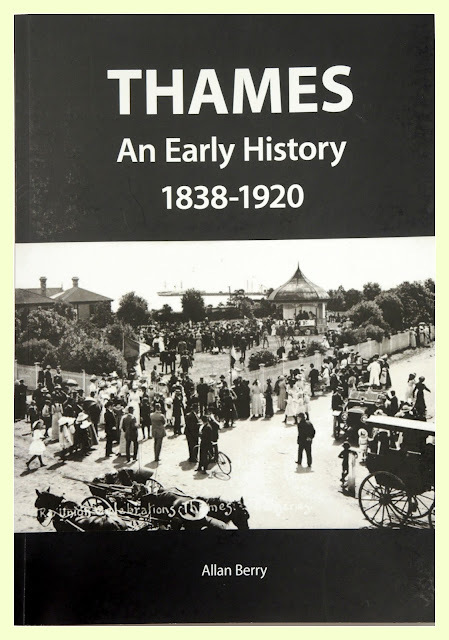 Thames An Early History 1838-1920 by Allan Berry is 252 pages; cost $50. On Saturday 5th August 2017, the Thames Museum is officially opening their new display area at 1.30 pm. After the official proceedings Allan will launch this new book. The cover of the book (right) is taken at the corner of Beach Road and Albert Street. With the Band Rotunda on the right and Station Masters house on the left. In the distance is the Burke Street Wharf.